The venue for the Hobie Kayak Bream Series 10 Australian Championship, sees the culmination of the 11 round series return to its grass roots, the scene of the first ever series decider, on Wallis Lake in Forster, on the New South Wales mid-north coast. The Series 10 championship will be held over 5 days, with anglers arriving and the welcome function on 13th February 2019, pre-fish on 14th February, and then the battle for the title of Australian Champion, will be fought over the following three days the 15th, 16th and 17th February 2019. In the beginning, when it all started back in 2009 on Wallis Lake in Forster, Scott Lovig, from the Mornington Peninsula in Victoria, became the first winner of what was then called the Hobie Kayak Bream Grand Final. Lovig brought four fish back to the scales, his winning two-day bag weighing in at 2.19kg, a mere 40 grams ahead of Michael Mass (Qld) 2.15kg and Ken Raley 1.95kg. On day two, Sydneysider, Wayne Robinson caught the Big Bream (The biggest fish of the tournament) which weighed in at 820g, outsizing the 780g bream Josh Holmes had caught on day one. At the close of the tournament both Steve Fields from Hobie and Steve Morgan from ABT promised bigger and better things were to come and they certainly have. Ten years on and with Hobie now exclusively organising and running the Hobie Kayak Bream Series, it has well and truly been established as the premier kayak fishing series in Australia. 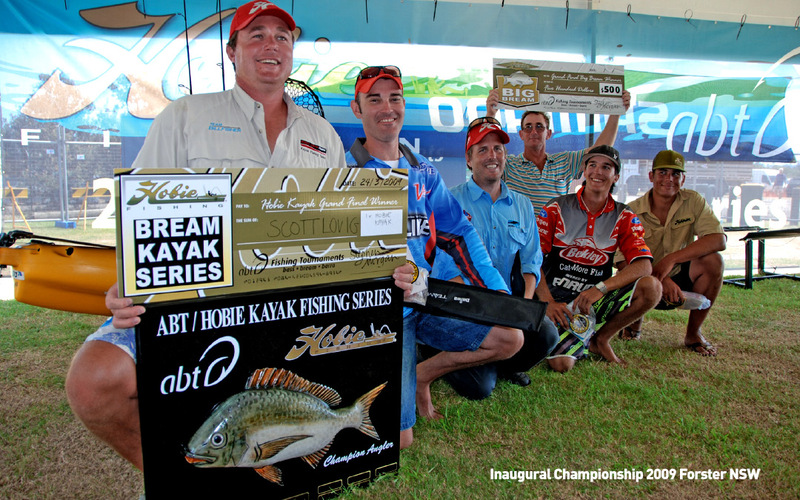 Thousands of anglers have competed over the years since Fields and Morgan made their pledge in 2009, and while there were just four tournaments in that initial year – Gold Coast, Mooloolaba, Sydney and Forster, many new locations across the country have become venues in the years that followed. Western Australia has seen events at Albany, Mandurah, Swan River and Blackwood River. South Australia has had tournaments in the city of Adelaide on the West Lakes canal system and the Adelaide River with others on the Glenelg River on the South Australia, Victoria border. Victoria has seen tournaments at Nelson, Warrnambool, Marlo, Mallacoota, Patterson Lakes, Lake Tyers, Paynesville and the legendary Bemm River. Forster, Sydney, St Georges Basin, Burrill Lake, Lake Macquarie, Woy Woy, Shoalhaven River, Tweed Heads, Port Macquarie, Narrabeen, Batemans Bay, the Clarence River and Ballina have seen some serious kayak tournaments take place in New South Wales. Queensland has had events at Bribie Island, Redcliff, Gold Coast and Mooloolaba, while two trips across Bass Strait to Tasmania saw a magnificent event at Anson Bay, and then a double at two pristine locations at Scamander and Swan River. With such a broad reach of venues across the nation, the average number of anglers competing in events has sky rocketed over the last couple of seasons with tournaments that once drew thirty to forty anglers now averaging sixty to seventy plus competitors and many more tournaments now regularly reach and often top one hundred kayak anglers. Historical winners of the Hobie Kayak Bream Grand Final have been the inaugural winner Scott Lovig (Vic) 2009, Daniel Brown (NSW) 2010, Daniel Brown (NSW) 2011, Shane Taylor (NSW) 2012, Darryl Head (NSW) 2013 and Chris Burbidge (Vic) 2014. The event was renamed in 2015 to officially become known as the Hobie Kayak Bream Series Australian Championship, this was to recognise the national scale of the event and to acknowledge the prestige each winner deserves. The first Australian Champion crowned was Stuart Dunn (NSW) 2015, followed by Richard Somerton (Vic) 2016 and Paul Burton (WA) 2017. The first round of invitations for the Hobie Kayak Bream Series 10 Australian Championship will follow shortly after the completion of round 10 of the series at Lake Macquarie. The final competitors to qualify will be named after the last event of the year at Mallacoota in Victoria. Two events are left to secure your spot in the Australian Championship.